Try this thirst-quenching drink that is delicious enough to sip all day! If you are going to be in the sun, running around being active and potentially having one or two…or three beverages throughout the day, you need to keep hydrated! This drink contains, sparkling water to keep your water intake up, lemon to alkalize, fresh berries to give you a hit of antioxidants, mint to ease digestion and just a hint of juice to savour your sweet taste buds. 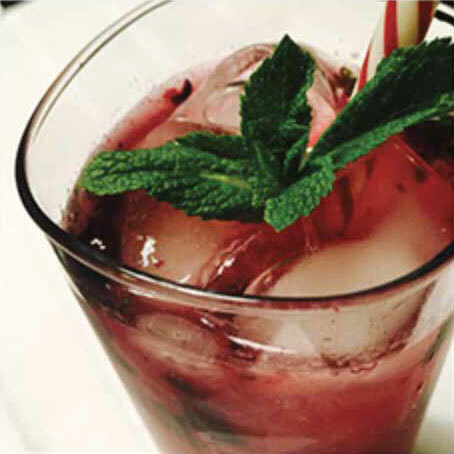 Add berries and mint in a glass and muddle. Add lemon juice, sparkling water, and juice (and alcohol if using) to glass. Note: Our bodies treat alcohol as a toxin. No matter what form it takes, your body can only process so much before there are short-term and long-term effects. Therefore, although these are less harmful alternatives, it does not mean you should over consume.